Photos courtesy of Todd Rose Decorative Concrete Inc.
Todd Rose Decorative Concrete Inc. is only 2 1/2 years old, but already, they've become "that contractor." You know the one. That contractor you call when a project has, midway through, suffered some sort of catastrophe. That contractor you call when you need someone who can carry a project from the architect's sketch through to that final coat of sealer. That contractor you call when some kind of concrete miracle needs to be performed. 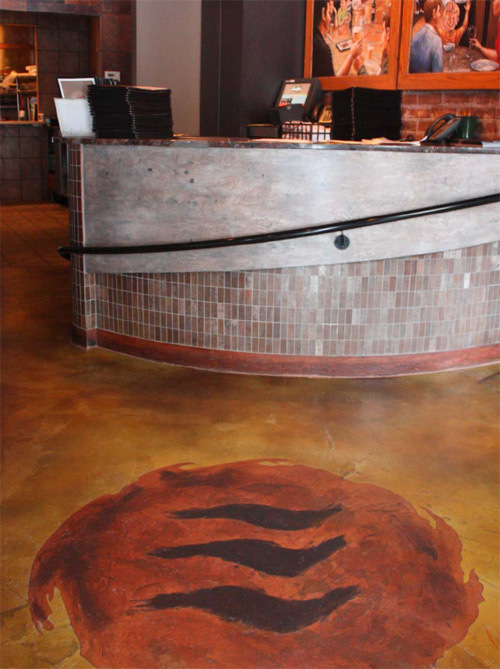 The combined skill and experience of co-owners Todd Rose and Keith Heiser has turned their young company into a go-to contractor for decorative concrete challenges. With offices in Omaha and Lincoln, Todd Rose Decorative Concrete is able to serve the bulk of the Nebraska construction market, offering services that range from the aforementioned sketch-to-sealer jobs (about 25 percent of their projects) to more narrowly focused work, doing staining, stamping, stenciling and restoration as a subcontractor (the other 75 percent). Aside from Rose and Heiser, the company employs 16 people, most of whom belong to one of four crews. 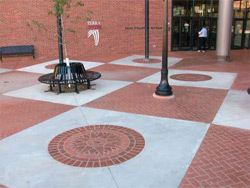 Although the company serves a variety of sectors (municipal, commercial, residential), its crews are separated into two divisions: the fresh concrete side, devoted to new slabs that are then stamped or stenciled, and the pre-existing concrete side, which encompasses staining, overlays, restoration and even polished concrete. This versatility has definitely played a role in the company's success. The story of the company's rapid success - in spite of a down economy, no less - began before its launch. 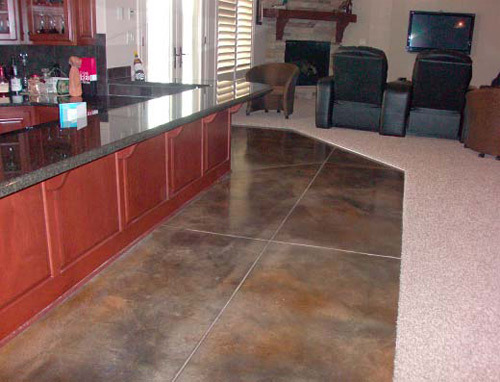 Rose has been working in decorative concrete for more than a decade and Heiser for more than three. They both worked for the same construction firm in Lincoln - Heiser as the head of the residential department and Rose in charge of the decorative concrete division - and they both, says Rose, "enjoyed a decent reputation as individuals." Counting on the relationships they'd built in the community, they decided to break away and set off on their own. Rose founded his company with himself as CEO, and Heiser came on as president about six months later. Their business plan, Rose says, was nothing fancy. Drawing on his college marketing background, the 40-year-old CEO sat down and wrote up a very simple business plan - from which, he says, they haven't deviated a whole lot. Rose borrowed the framework for their business approach from his college coursework. "Marketing 301 taught me that all marketing really is, is to educate and inform and provide a solution," he says. "We're constantly trying to do that." That methodology governs their approach to their clients and to the industry at large. For example, Rose and Heiser take very seriously the responsibility of helping homeowners make informed decisions on installing or renovating hardscapes. 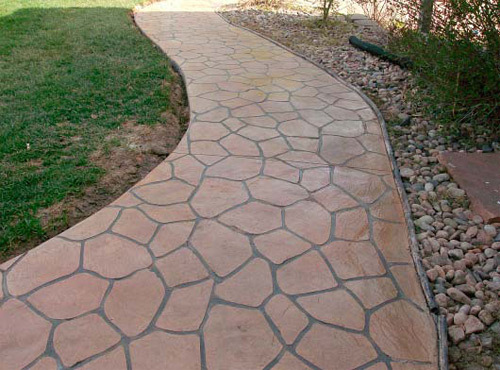 They believe firmly that simple, well-executed decorative concrete is a great way for homeowners to invest in and transform their home. "If you approach it from (the homeowners') standpoint, it becomes a pretty intimate thing," says Rose. "You're giving them much more than concrete." The "educate, inform and solve" concept is even more essential to the company's approach to fostering relationships in the industry. 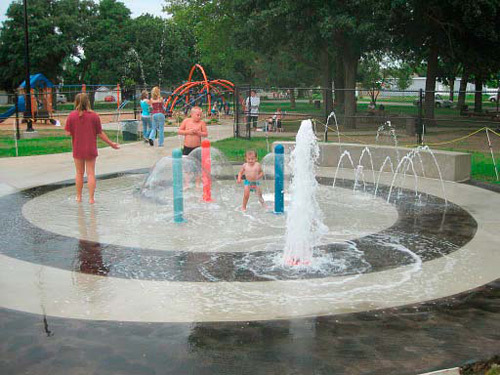 Although both Heiser and Rose are comfortable up to their elbows in mud, they spend a lot of time in front of local architects, answering questions and championing the decorative concrete cause. "I think there's been quite a few projects that Todd and I have seen where the installer really didn't know what they were doing," say Heiser. "That sets a big burden on the architect when they want to do another decorative project." Thus, part of the company's mission has become educating the local construction community about concrete's strengths and limitations. For the price of a few pizzas, says Rose, they've ended up with a building community that is not only more realistic about decorative concrete, but also more excited about it. "The more they know about it, they more they want it," he says. Their educational efforts aren't just for the benefit of locals, either. 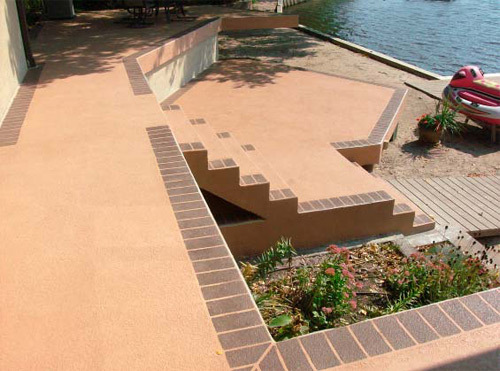 Rose and Heiser are both committed to elevating standards across the decorative concrete industry. Rose says he sees an industry-wide "tendency to overpromise and underdeliver," which he attributes to the industry's rapid growth and the possibility that not all contractors and manufacturers devote as much time or resources to training as they should. So that covers the "educate" and "inform" elements of the company's approach. What about step three, providing solutions? As it happens, step three is Rose and Heiser's specialty. "The No. 1 thing that has been the backbone of our success is that we have somehow become the name, in Nebraska, if the job has gone wrong or gone south for another contractor or someone can't figure out a solution to their problem," says Rose. "Between Keith and I, we can figure out a solution for them." "When you can do that," says Heiser, "it really sells itself." Take a project that came into their offices a few months ago, bringing a team of six designers with it. A wealthy homeowner was after a high-performance surface for a large driveway and courtyard - oh, and he wanted it to look just like limestone. The first words out of the mouths of the design team were not encouraging. "We hate concrete," they said. "I kind of laughed," says Rose. "'Uh, do you not see the sign on the door?'" Despite their opening volley, the designers had come in because, while they didn't like the look of gray concrete, they were fans of its durability. It took a lot of experimenting with mix designs (made easier by Heiser's long-standing relationship with Lincoln ready-mix supplier Ready Mixed Concrete Co.), but they finally settled on a mix that gave them the look of limestone without compromising the surface's durability. 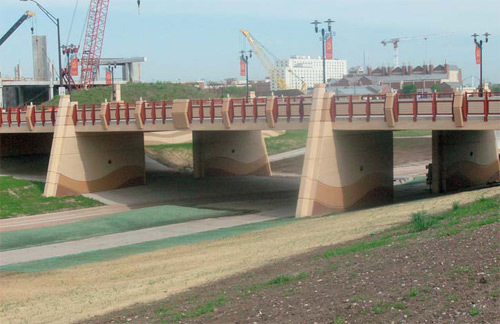 "It was a great challenge and a fun job," says Heiser, "and it came out great." For another example of the company's problem-solving prowess, look at one of their first projects, a restoration they did for a realtor's entryway in downtown Lincoln. The client couldn't close the offices during the week and the work was to be done on the building's sole entrance, so everything - from tearing out the existing slab to placing a new stamped surface with multicolored, exposed aggregate - had to be done between Friday night and Monday morning. Nothing went as planned. The weather didn't cooperate. The hotel down the block tried to shut them down because of the noise. The crew discovered that beneath the existing surface was a second slab that also had to be removed. Despite all of that, Rose, Heiser and their crew turned the project around that weekend, much to the delight of the client, and the job became a great advertisement for the company. "It's amazing, when you take a project on like that, how the building and design community talks," says Heiser. Challenges like these are what Rose and Heiser thrive on - and what they're counting on to carry them into the future. "We've got some pretty big dreams," says Heiser. Meanwhile, Rose's priority continues to be delivering quality craftsmanship and education, hoping that will raise the bar for the industry. "We believe in the industry as a whole, and we believe that bad installations hurt all of us," Rose says. "We want to see every install, whether we do it or not, done successfully." For years, officials with the Clark County Department of Aviation knew Terminal 1 at the McCarran International Airport in Las Vegas was in need of a fresh concrete overlay job. Wide, deep expansion joints placed long ago posed dangers for travelers, and the airport was paying for it.